Sounds like a very workable plan, Mark. We will 'stay tuned'. Many years ago I could never figure out how to drive directly (or even indirectly) from La Gringa to Guadelupe Bay beaches, but maybe you can hopefully find one. Barry, I traced the road from la Gringa to Guadalupe with a Google Earth kmz file, you can U2U me and I'll send it. It gets very faint up at the Guadalupe end but it definitely enters that wash from the coordinates I gave in the last post. I guess I'll scope it out to see what kind of a vehicle can get through. It may be only quad-passable. David, thanks those are nice images. They seem about the same resolution as the high quality GE images but for areas where GE is low rez they will definitely help out. Doesn't appear to be elevation data though so you can't tilt to get a sense of the terrain. I drove north out of La Gringa a few years ago hoping to get up there but everything got to the point that something narrower than my Rodeo could get through. Be awesome to find the right road sometime! I don�t want to get down the canyon and find that it�s impassable again. 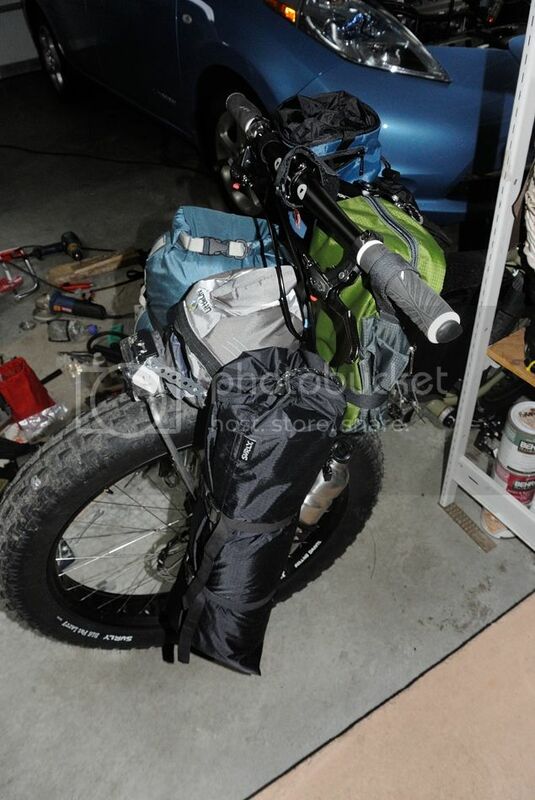 So I will ride my bike up the dry lakebeds from the BoLA highway to where I got last time with the car, but then go over towards ESG�s campsite and hike up the hill at the place where Eidsco has a photo on GE. From this photo you can also see that the hills aren�t too steep. This looks like a difficult area to me. It will be interesting to see what you think of it. Once you make it to Botica dry lake the only rough spot you will encounter is the 40' cliff that ESG had to lower his packjacks over. Once past that it is smooth sailing. Have fun. Off grid, 12-190watt evergreen solar panels on solar trackers, 2-2812 stacked Outback inverters, 6-2v enersys 125-33 2000 amp hour AGM batteries, FM 80 and MX 60 Outback charge controllers, X-240 Outback transformer for 220v from inverter, 6500 watt Kubota diesel generator. 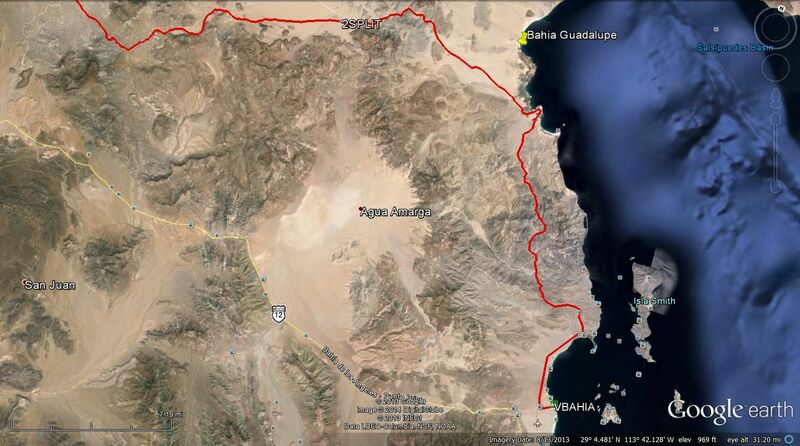 The Bill Nichols motorcycle trail goes from LA Bay to the Bahia Guadalupe area. Here is a GE view of it. I'm sure there are a couple of places a 4 wheeler can't get thru. The below coordinate does not look right when plotted on GE. Could it be a mistake? Never let a Dragon pass by without pulling its tail! The next few km after that look the most challenging, so if you make it through that you are probably OK. It would be a long twisty journey, it must be like being in one of those hedge mazes that never ends. From there you could packraft up to the Calamajue area and ride out, or make your way over to Punta Final. But first I want to get down Salsipuedes! OK, it's on. I fly to Las Vegas on Thursday and Mark will give me a ride to San Diego where John Mcfrog is giving me a ride down. We leave Friday early am then drive non-stop to the BoLA turnoff, and camp around the Mission San Borja road. Then Saturday I'll say goodbye and head off up the dry lakebed. I hope to get all the way to ESG's campsite that day, it is 40 km which should be do-able if there is no headwind. If it's passable then I know I'll be home free because I don't see any other obstacles up until Larry's photo, and if he got there with quads then I can get down with a bike. Then I can commit to going down and not have to worry about getting stuck and running out of water. So we'll see how it goes, I'll figure it out once I'm in there. I think I should be able to do a lot of exploration since it isn't hard to ride 20 km a day if it's just sandy with no rocks. So I should be able to go all over that canyon network in fairly good time. It's going to be quite a bit hotter this time so I'll have to be careful with water. I am going to lug a ton of it over from the highway and stash at the bottom of the hill at ESG's campsite, shouldn't be too hard to do since it is a flat road. I'm a little unsure though how to determine if the water I might find from an oasis has mineral contamination. I'd like to go up to that oasis up Asamblea, if I could find water there that would be awesome, it would really provide a nice buffer of safety. Then in mid-April Mark and Morgan and the gang will come down to Guadalupe where I'll meet them and hang out for a few days and then go back with them! Not sure if I'll take a break after a couple weeks and resupply in Bay of LA or not, or if I'll just spend a whole month out there. My food will run out after 2 weeks so I'd have to survive on fish. Can't complain about that! Is that the Window Rock Trail? how do you protect you stash of water from coyotes and other critters? You won't have any trouble going down the Botica dry wash, easy, sand and a gentle down slope until you get to the cliff near the bottom. Once down the cliff it is pretty simple over to the entrance to Salsipuedes and then the first branch to the right is Asamblea. If you take the branch to the right you end up at the ranches where you started your last trip. You know what obsticles to expect up there. If you go up Salsipuedes you will end up at the Botica dry lake and you will again be in familiar territory. Trying to travel along the coast from the mouth of salsipuedes on down to Guadalupe will be rugged. there will be lots of boats fishing in the area so some help will probably be available. Good luck and keep us posted. Thanks to David K for some good info. Getting stoaked for this trip with Mark. Life is definitely good. One more of the last details. Is the gas sold by venders at Catavina generally ok? it is generally ok. FWIW! The gasoline and diesel sold out of Jerry cans at Catavi�a comes from the Baja Cactus Pemex station in El Rosario. There are two Pemex stations in L.A. Bay, so top off there and El Rosario. Hey Woody, I bury it. But it is a bit dangerous to rely on a stash because if they find it then you could be in trouble. So maybe better to carry it all with me. Thanks Larry, looking forward to retracing your tracks! I'll keep an eye out for Indian paintings in areas where it looks habitable like around oases. I have to say, I'm intrigued by what Asamblea will be like. If I can actually ride most of it, that will be one long, twisted journey. You could go crazy if you didn't have a map and didn't know where you were. Curve after curve after curve. Thanks for the support John! Everything is coming together, all my stuff is sorted out in various piles, now just have to pack it all up! I'll send you some kmz files. Thanks David for all your advice! As before, have a fantastic adventure, and I will happily post your Spot maps or anything else you would like of me, that I can do! 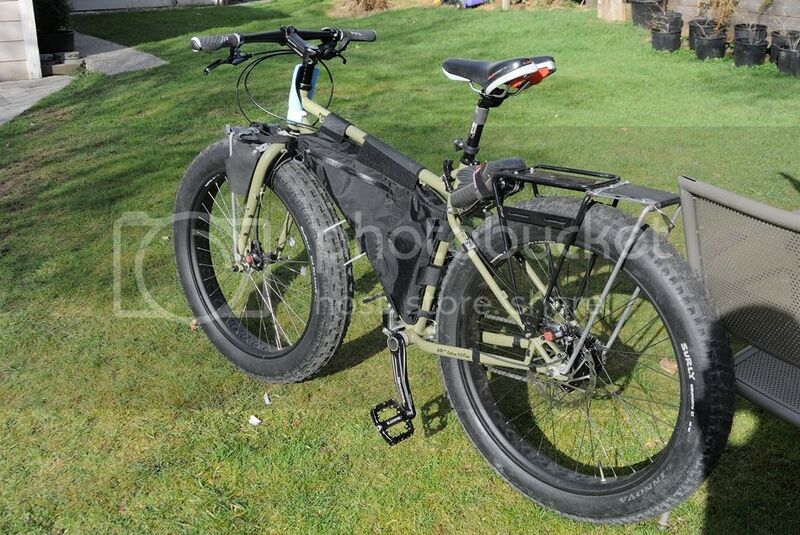 Here is my bike I am using, a Surly Pugsley. No derailleur to get hung up, this one is internally geared.